Edwynn Houk Gallery is pleased to announce an exhibition of new works by Sebastiaan Bremer (Dutch, b. 1970). The show opens on Wednesday, 3 May and runs through Saturday, 24 June 2017. The artist will be present at the opening reception on Wednesday, 3 May, from 6-8pm. Sebastiaan Bremer took the photographs that form the basis of his newest series, Ave Maria, 23 years ago when he was 23 years old and had just traveled to the United States from Amsterdam. Soon after moving to New York, he met and fell in love with Andrea Lerner (the Brazilian choreographer and half of the duo, chameckilerner) who would later become his wife. Sebastiaan took several photographs that day of Andrea in the bathtub in their East Village apartment. He revisits these images as an exploration into the effect of time on the couple’s relationship and their individuality. Rather than painting each photograph as it was taken within its full-size frame, the artist created more close-up croppings of body parts: Andrea’s expressive hands, her floating face, her strong dancers’ legs. 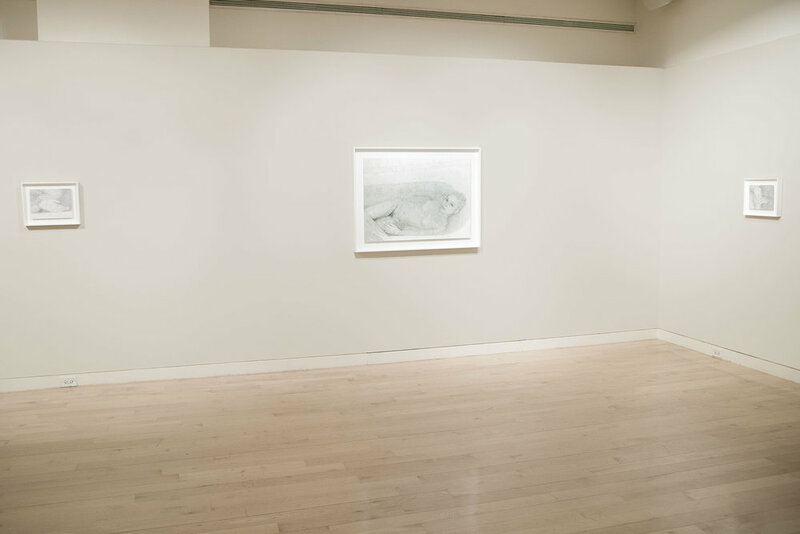 He printed the photographs very softly, on matte-surface paper, to look more like delicate charcoal drawings rather than traditional photographs with hard edges and lines, an effect that elicits a sense of memory as well as enhances feelings of nostalgia, romanticism, and mystery. Utilizing his signature style of obsessively applied dots of paint to the photographic surface, Bremer applied the teeny-tiny black dots on these works to meander through time, creating movement and ripples in the water, and as a kind of topographical map tracing mountains, valleys and peaks, in both body and time. Sebastiaan Bremer lives and works in Brooklyn, New York. He studied at the Vrije Academie, The Hague, and Skowhegan School of Art and Sculpture, Maine. He has published three major catalogues: Monkey Brain (2003), Avila (2006), and To Joy (2016). His work is included in the collections of the Museum of Modern Art, New York, LACMA, 21C Museum, and the Victoria and Albert Museum, London among many others.